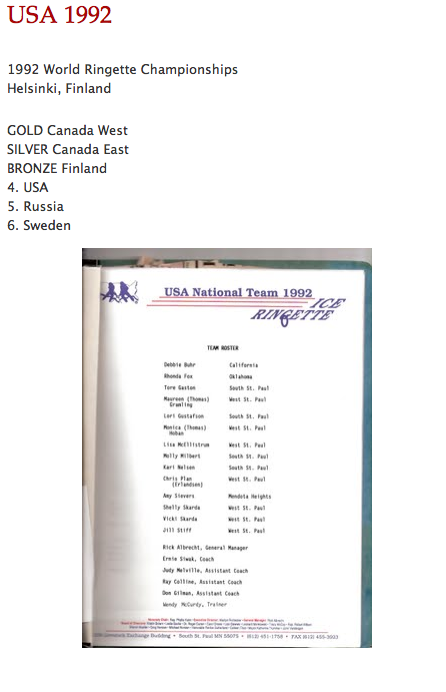 Were you a player for Team USA Ringette? Interested in reconnecting with some old teammates and friends? Team USA wants to hear from you! Contact us with your name and year(s) played to be added to our Alumni Registry. Ringette was played in various places in Michigan during the mid-1970s and 1980s. 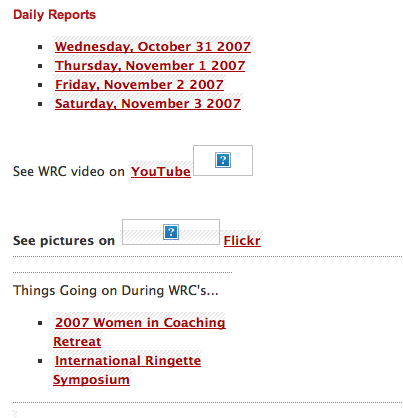 This included Alpena and Flint with Flint actually establishing the Flint Ringette Association. The sport fizzled out around the late 1980s in the area and the association disbanded. As part of a larger effort to expand athletic opportunities for girls and women, Ringette was introduced in Minnesota in the mid-1970s. 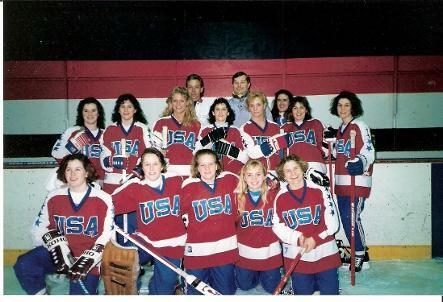 During the 1980’s Ringette took hold in St. Paul and surrounding suburban communities, including West St. Paul, South St. Paul, White Bear Lake, North St. Paul, Cottage Grove, Inver Grove Heights, Eagan, and Rosemount. 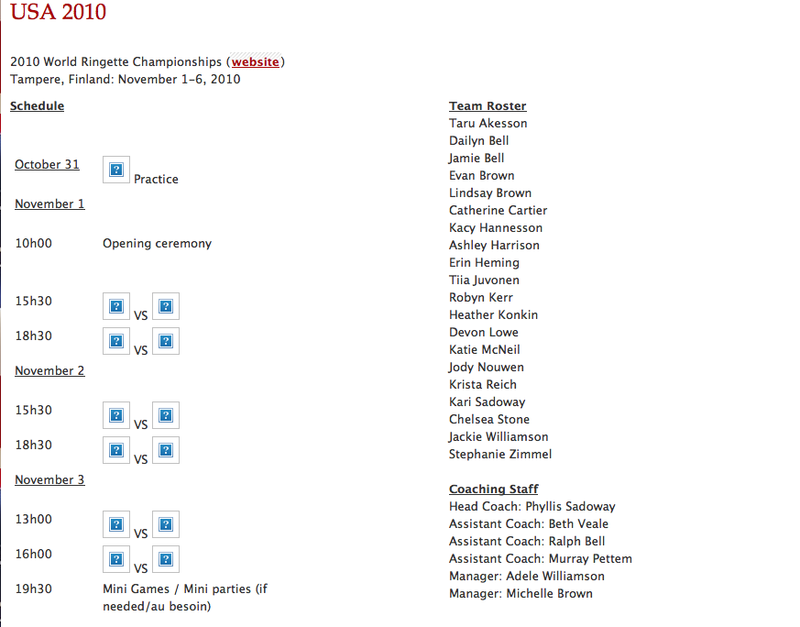 A Metro Ringette high school league was formed. 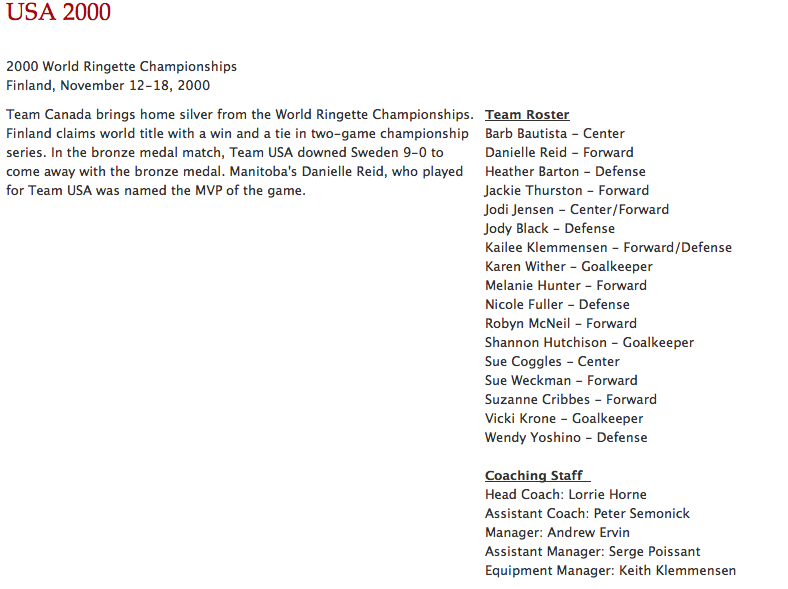 By 1990 the Minnesota Ringette Association had over 1,000 reigistered players. During these same years the sport was established in Grand Forks, North Dakota, and Viroqua and Onalaska, Wisconsin. Teams from the three states participated in competition each winter with teams from Manitoba and Ontario. Major landmarks were the North American Cup tournament in 1992, participation in the Star of the North Games in 1994, and the hosting of the World Ringette Championship, also in 1994. A one day “Super Sunday” tournament for all Minnesota teams was held in 1994, as well. 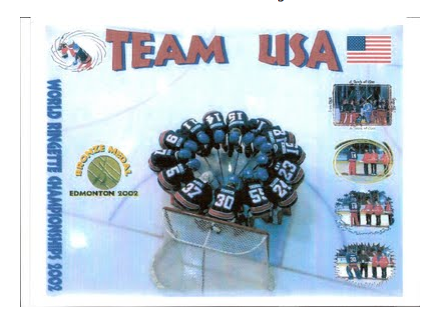 With leadership in Minnesota, Ringette USA did develop an increasingly strong national team. 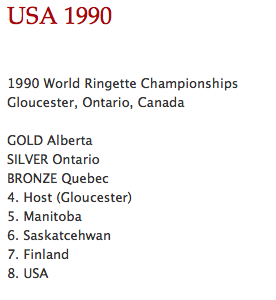 1994 was the watershed year for Ringette in Minnesota. 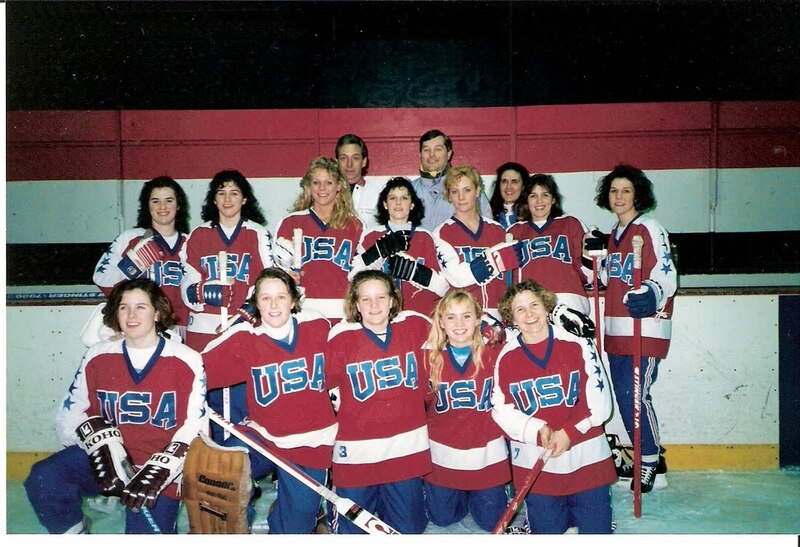 While several landmark events were held that year, the Minnesota High School League voted to endorse ice hockey over ringette as an official high school sport for girls. 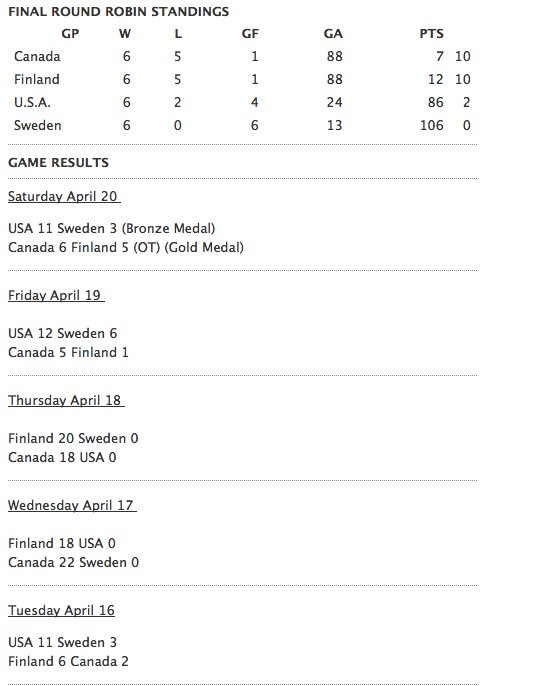 This brought an end to high school ringette teams, and a shifting of local organizational resources to hockey. 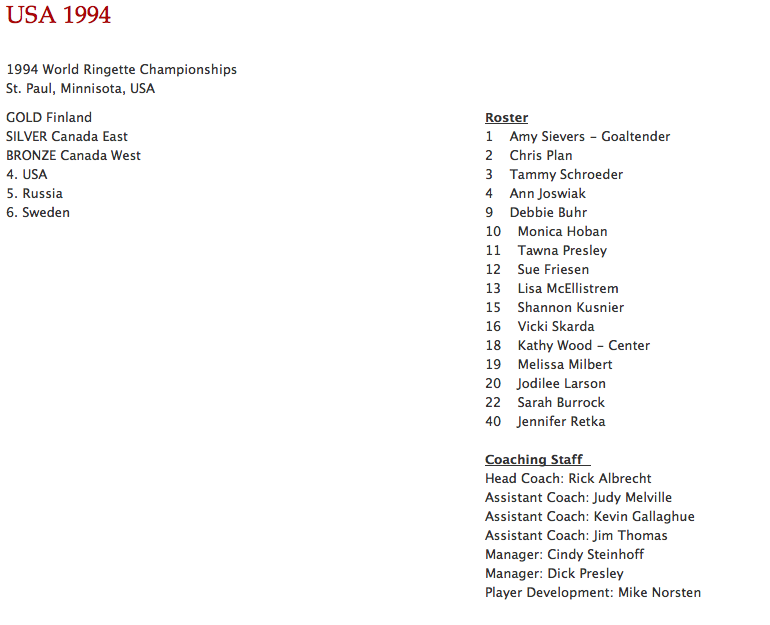 By 1996 fewer than 100 registered players participated in Minnesota ringette. The North Dakota teams had ceased play earlier, with the two Wisconsin programs following suit. A small Metro Ringette program did continue offering this athletic opportunity for girls and women, based in White Bear Lake. Teams continued to have annual competition with teams from Northwest Ontario. 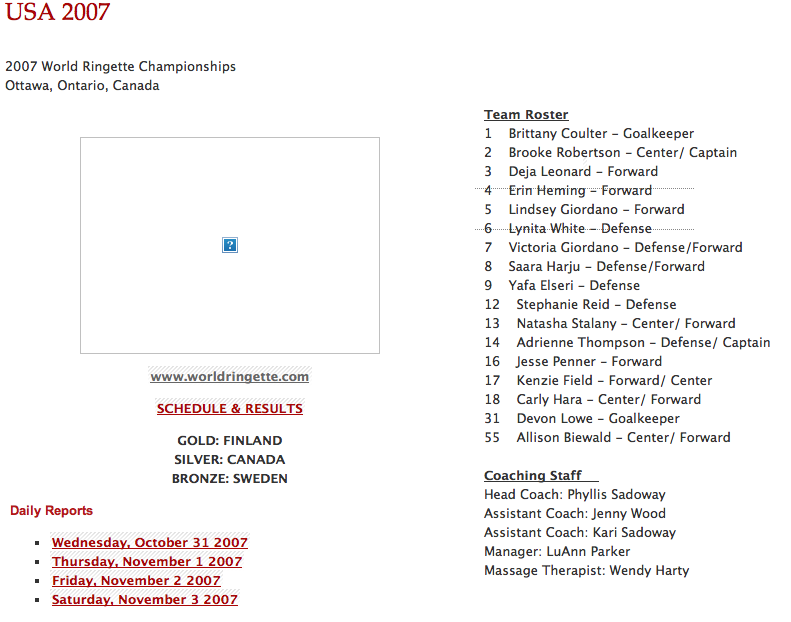 A major highlight was the hosting of the Ringette Friendship tournament in December 2000, with teams from Finland and several Canadian provinces. 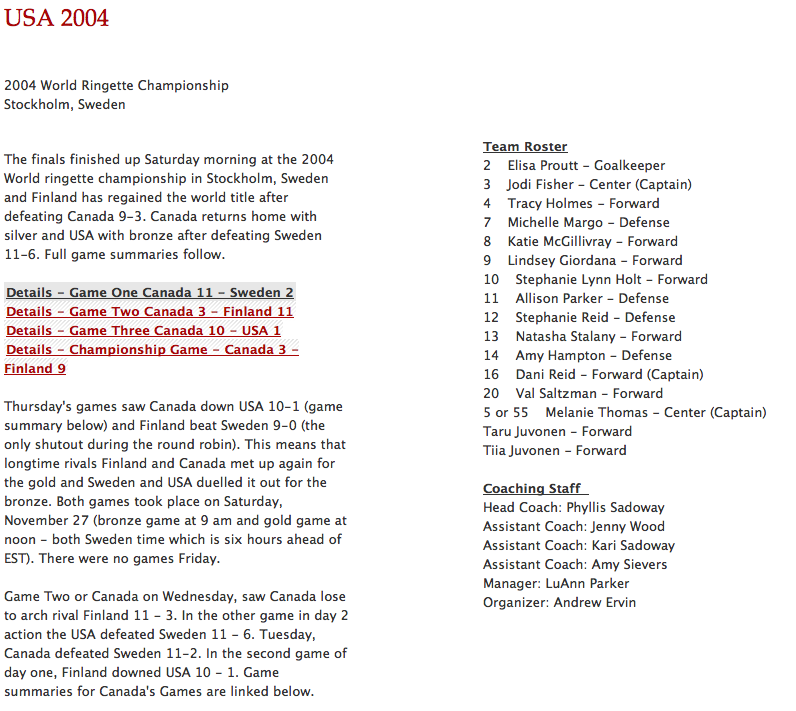 The development of the 2000 National team piqued the interest of a number of women hockey players in the Dallas-Fort Worth, Texas area, some of whom had Canadian roots. This lead to the establishment of ringette programs in the area for both girls and women for a few years. 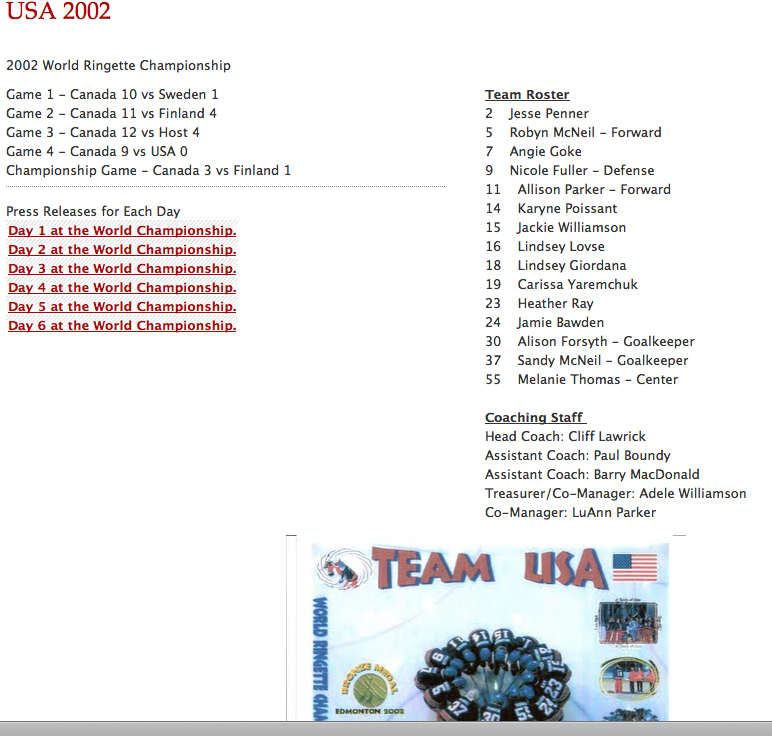 Ringette continues to make strides in its effort to increase popularity throughout the United States. If you are interested in learning more about Ringette, setting up a 'Come Try Ringette' session in your area, or starting an association please contact USA Ringette! 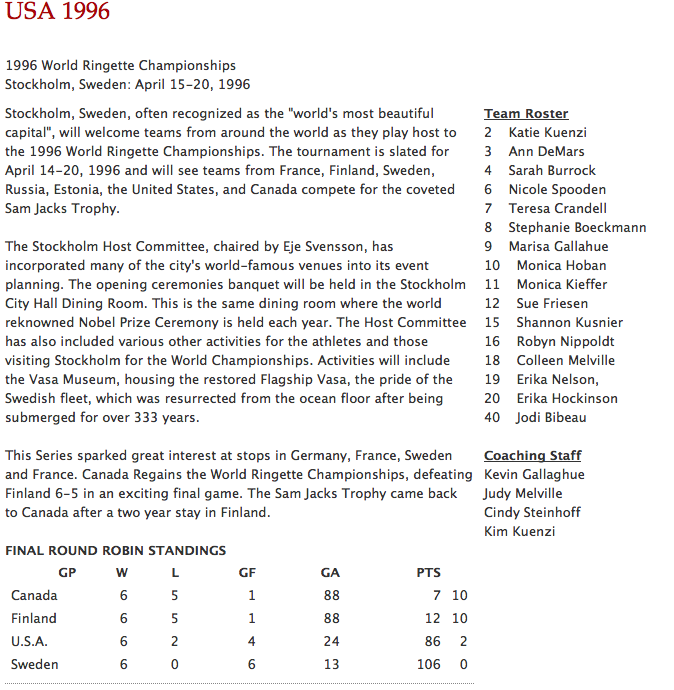 Fun Fact: The 1994 World Ringette Championship was held in St. Paul, Minnesota! 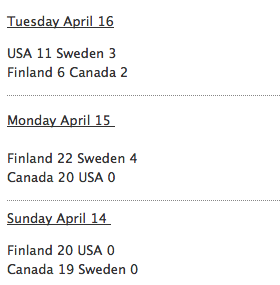 Team USA finished 4th.